Distinguished barrister has played a leading role in law reform for women. 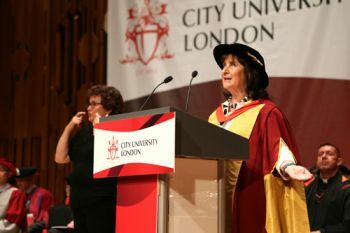 Baroness Helena Kennedy QC, a City University London alumna, has been awarded an Honorary Degree of Doctor of Laws in recognition of her contribution to human rights and equal opportunities for women. Baroness Kennedy is one of the most distinguished lawyers in the United Kingdom. She has practiced at the Criminal Bar for 40 years, appearing in some of the leading cases of this period. These include the Balcombe Street Siege, the Brighton bombing trial, the Israeli embassy bombing, the Guildford Four Appeal, the Michael Bettaney Espionage case, the Jihadist fertiliser bomb plot and the Trans-Atlantic bomb plot. Learning is one of the great joys that determines who we are as a person and how we can fulfill our role in life. Born in Glasgow in 1950, Baroness Kennedy was educated at Holyrood Secondary School where she was Head Girl. She studied law in order to ensure access to justice for those ill-served by the legal system and completed her studies at the Council of Legal Education. Baroness Kennedy was called to the Bar in 1972 and took silk in 1991. During her acceptance speech she reminded graduands of the need to learn as much as they can about the human condition. Baroness Kennedy said that it was important for prospective lawyers to come to terms with the ways in which people experience suffering. In this regard she mentioned people who have experienced domestic and physical violence. Baroness Kennedy has played a leading role in law reform for women, developing the Battered Women’s Syndrome defence in the English law courts, and writing several books on issues related to domestic and sexual violence. She has also been a leading voice for equal opportunities for women within the legal profession. In 1987, Baroness Kennedy and playwright Peter Flannery co-wrote the successful television drama series, ‘Blind Justice‘, unveiling many of the legal scandals of the day. Baroness Kennedy of the Shaws QC, joined the House of Lords in October 1997. In this capacity, she chairs the European Union sub-committee, having also served on the Joint Committee of Human Rights. In addition to being Principal of Mansfield College, Oxford, she is chair of the human rights organisation, Justice, and co-chair of the International Bar Association’s Institute of Human Rights. She is an Honorary Fellow of the British Academy and the Royal Society of Edinburgh and has received Italy’s highest honour, the Cavaliere di Gran Croce and the French government’s Palme Academique. She is the new chair of the Booker Prize Foundation. "Be determined to succeed, get experience wherever you can - in legal advice centres, law centres - wherever. Be prepared to set up a law NGO yourself with colleagues even. People need access to justice."